Treat it like any other week and let the goosebumps hit you the night before – or, if you can hold them off, the morning of. Argos defensive end Ricky Foley probably isn’t the only one thinking that way heading into Thursday night’s season-opening tilt with the Hamilton Tiger-Cats at BMO Field. After all, for the Argos it’s more than just the start of a new season or a clash with a rival – it’s a new beginning. Head Coach Scott Milanovich still hasn’t fully come to terms with it. “There’s just a lot of excitement right now for the guys,” the Argos’ fifth-year head coach added. “I walk through that locker-room and it still seems too good to be true for us from some of the things we’ve had to deal with. After years of settling for less, Thursday’s season-opener at newly-renovated BMO Field has been a long time coming for the Argos. An outdoor venue on the Lakeshore; brand new locker-rooms; tailgating outside – football the way it’s meant to be enjoyed whether you’re a fan or a player. It starts with a rivalry clash against the Ticats, the same team that eliminated the Argos late last year in the Eastern Semi-Final at Tim Hortons Field. For two teams expected to contend for an East Division title, Thursday’s matchup means as much on the field as it does off it. 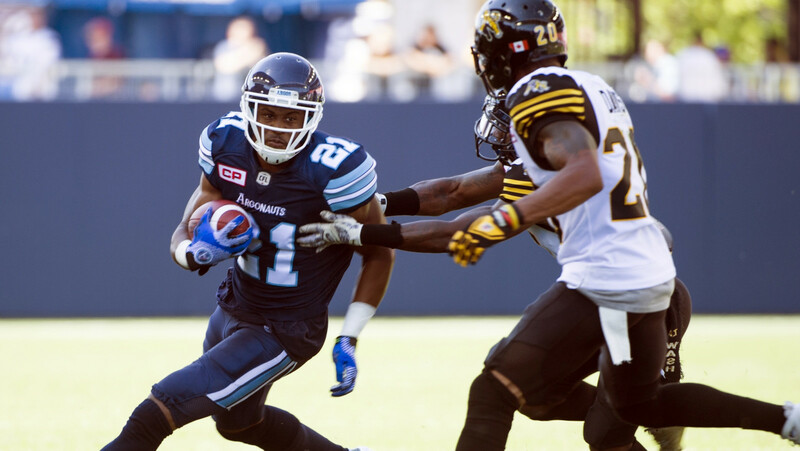 The Argos enter the season with plenty of reason for optimism, not just for their new setting. It starts with who’s under centre. Getting the start for the Argos is one of the CFL’s all-time most accurate passers in Ricky Ray, who’s worked closely with throwing guru Tom House to get his shoulder back in shape. By all accounts the veteran pivot is looking far from old Ray but instead the Ray of old. “I’m feeling really good,” said Ray. “I haven’t been super healthy here of late and coming into this camp I felt really good and had no problems. He also gets some help in front of him, where perennial all-star tackle Josh Bourke joined the Argos from Montreal along with former fourth overall pick and versatile guard/centre Corey Watman from the Riders.Ray will lead an offence that was rebuilt last season with an assortment of first- or second-year CFL receivers, from the towering Tori Gurley who led the CFL with 10 touchdown receptions to the athletic Vidal Hazelton. While Ray and the Argos hope continuity will help them improve an offence that ranked sixth overall last season, the worst of Milanovich’s tenure as Argos head coach, the biggest improvement may come on the defensive side of the ball. One of the CFL’s top defensive minds in Rich Stubler came to the Argos from Calgary, while the Argos have also recruited a few former Ticats in Justin Hickman, Bryan Hall and Brian Bulcke. Bulcke won’t play in Thursday’s game as he’s been placed on the six-game injured list, but the Ticats should expect a different-looking Argo defence than the one they’ve grown accustomed to facing. “I’ve played in this league a while, I’ve always respected [Stubler] as one of the better coordinators,” said Ticats tackle Brian Simmons. “It’s not going to be the typical Toronto D we’ve seen in the past. Not lost on the Argos is the importance of starting off this new era on the right foot. With so many extra eyes, the Boatmen hope to capitalize early and get momentum on their side. The Ticats are also quite aware of the situation and would love nothing more than to play spoiler against their most hated rivals. They’ve had the Argos’ number over recent years, last season taking all four head-to-head matchups including the Eastern Semi-Final. Some key faces are out of the fray for Thursday’s matchup for the Ticats, from safety Craig Butler (out for the season) and defensive tackle Ted Laurent (placed on the one-game) to quarterback Zach Collaros, who continues to recover from the torn ACL that ended his 2015 season. On the offensive side of the ball, Jeremiah Masoli gets the start after earning the job in pre-season over 24-year-old Jeff Mathews. Masoli picked up where he left off in last year’s Eastern Final, throwing for 179 yards and a touchdown on 15-of-24 passing in two pre-season games. Masoli will play an important role for the Ticats in his first career opening-day start. While Masoli will face some familiar foes in former teammates Hall and Hickman on the Argos’ D-line, he’ll be throwing the football to one of the biggest Ticats villains in recent memory. Chad Owens is the biggest name among many to switch sides in the Toronto-Hamilton rivalry and will no doubt have a chip on his shoulder after leaving the Argos in the off-season. “This is the closest you’re going to get to a playoff game,” Owens said. “Even though it’s Week 1, it’s probably going to feel like a playoff game. It’s going to be a playoff-type atmosphere and that’s just what it is. Owens joins other dynamic Ticats receivers Tiquan Underwood, Luke Tasker and Brandon Banks, while the biggest focus in Hamilton may be on the defence. Laurent’s absence leaves a big hole on the D-line, while Geoff Tisdale is the Ticats’ starting boundary cornerback after signing with the team only this week. Free agent add John Chick will start at the end and should be a force for the Ticats, but all in all Defensive Coordinator Orlondo Steinauer has his work cut out for him with many new faces in the lineup.